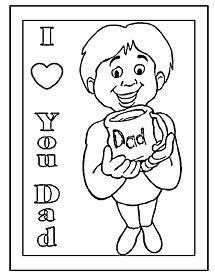 Crafts and Coloring pages for Fathers Day are a very special unique gift for Dad, Grandpa, Uncle,or that very special father-like figure. Let your children create something special for dad this Fathers Day with Fathers Day the creative crafts below and coloring pages.There are two different Fathers Day coloring books below with 5 pages each so your Sunday School children or children at home can color their special dad a page to hand deliver to them. Dad will love these gifts! Kids of all ages will have so much fun creating these unique gifts for dad. We actually have two claims to the first Fathers Day celebration in the United States. The first claim was on June 19, 1908 in the state of Washington, and the second claim was a few weeks later on July 5, 1908 where an independent celebration of Fathers Day was held in Fairmont, West Virginia. Fathers Day was first recognized during a church service at Williams Memorial Methodist Episcopal Church South in West Virginia. Grace Golden Clayton is believed to have been inspired to celebrate fathers after a mine explosion in a nearby community a few months before. This explosion had reported to have killed 361 men in which many of them were fathers and recent immigrants to the United States from Italy. It was reported that Grace suggested the church service to the Pastor at Williams Memorial. Mrs. Sonora Smart Dodd was another driving force behind the establishment of Fathers Day. William Jackson Smart was her father who raised six children as a single father in Spokane, Washington. She initially suggested setting Fathers Day on June 5th (her father's birthday), but other people involved did not think that they would have enough time for a fitting celebration. So this lead to the first Fathers Day being held on the third Sunday of June instead. The first June Fathers Day was celebrated on June 19, 1908 in Spokane Washington at the Spokane YMCA. Return to Fathers Day Ideas from Fathers Day Crafts & Coloring.